Click on Sherman to go to his official website. Sherman Alexie has been on my top ten authors list since I read The Lone Ranger and Tonto Fistfight in Heaven (1994) while living in the Rocky Mountains. Perhaps it was the close proximity of the mountains, the various trips I took to reservations throughout the western states, or perhaps it was just his quick wit and the heart-breaking comedy of the lives of his characters. In any case, when Alexie writes, I read. I have read many of his works and was inspired by his short stories and novels to explore more contemporary American Indian authors. 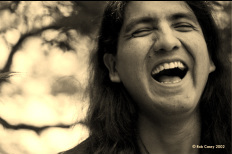 Through Alexie's influence, I discovered a wide variety of other authors with quite a diversity of writing styles: Vine Deloria Jr., Joy Harjo, Zitkala-Sa, N. Scott Momaday. Louise Erdrich, Marla N. Powers, Paula Gunn Allen, Simon Ortiz, Patricia Riley, Leslie Marmon Silko, and James Welch. While I like these authors very much, I still feel a strong affinity to Alexie's writing. There is something about how he mixes the everyday with the absurd to create a rich scenario in which he tells his stories. Alexie as storyteller is perhaps my favorite of his writing forms. While Alexie is perhaps best known for his poetry, I love that his short stories are so interwoven that they could be read separately or as part of an entire work. This coincides as part of the art of true storytelling which is more cyclical than chronological and I believe is the real way that we access our memories. When a reader first encounters Alexie's writing, it can be shocking when you realize that a character you had come to love will later become a fanatic on the edge of sanity (e.g., Thomas Builds-the-Fire). But, in real life, this is what happens with the people we know; they are all of the memories that we have of them, not just the immediate. It is important that readers are aware that one person's world view is not necesarily the only world view. I truly enjoy reading about the lives in Sherman Alexie's writing, but I know that I need to be careful that I do not extrapolate his views as the only views of reservation life (especially Spokane Indian Reservation life). While researching other critiques of Alexie's writing I saw that there have been quite a few comments on the "hopelessness" of Alexie's reservation life and that characters can only be succcessful if they manage to get "off the rez." I don't know that I necessarily agree with this interpretation (perhaps due to that fact that I have read so much of his work) because I don't know that he is collecting all people into his perception of life on a reservation. It is perhaps his own view and I would guess that Alexie would agree with this. Obviously Sherman Alexie has experienced success in life but I do not believe that he would say that his stories are designed to be the only view of reservation life. However, for the reader who has not read a wide variety of American Indian literature, then it would be important to keep this note in mind. Teachers using Alexie's newer foray into YALit should be aware of this cultural/societal issue when using The Absolutly True Diary of a Part-Time Indian, Flight, or The Lone Ranger and Tonto Fistfight in Heaven. Educators need to be vigilant in portraying the good with the bad. Being American Indian (yes, I said Indian, not Native American, we will discuss later) is as unique an experience as any ethnic identity. I suppose that teachers using these books could read them with an eye towards the story arc alone, but I would be sure to include research with this as well... and not just pick-your-favorite-tribe-powerpoints either. There are some wonderful resources out there. I read an interesting comment about using Diaries in the classroom on this discussion board <http://ncte2008.ning.com/forum/topics/teaching-sherman-alexie>. In essence, the initial response to using this text was that teachers need to be careful not to show reservation life as devoid of any hope. A wise bit of advice. Too often, I think teachers get caight up in trying to use multicultural literature as a means to an end. It is a great learning experience to see that contemporary American Indian life is as rich as any other with all of the same issues, problems and successes of any ethnic group. One website that I have used frequently is <wwww.oyate.org >. It has a great booklists section and links to more informative sites valuable to a deeper interpretation of American Indian Literature.